Working on this design for Mark Loy was a real pleasure. I had only known Mark for a short period of time but have had a passion for music my entire life. 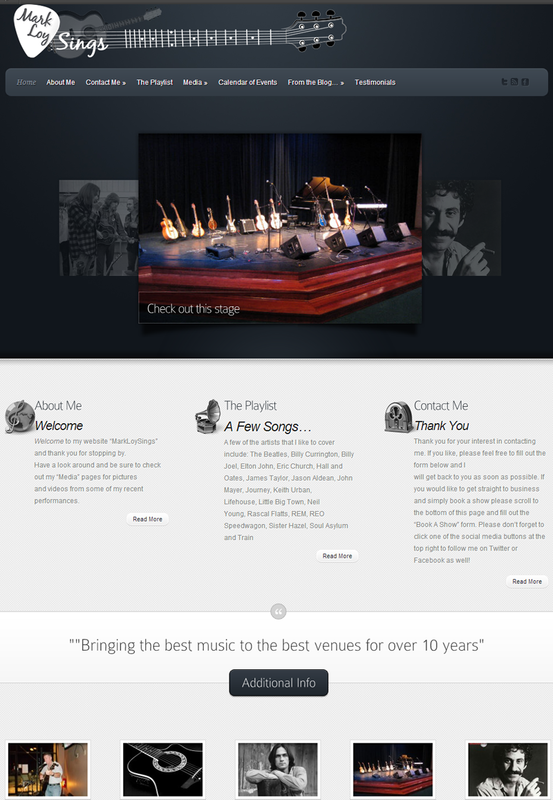 Mark was looking for a website that would give potential venues and friends a place to meet and listen to his music. It needed to match his style of music and professionalism. An acoustical guitar player who resides in the Akron area and plays at local nightclubs, wineries, weddings and outdoor shows, Mark is always looking to expand his list of fans. With the right mix of media, social media integration and a good design, he is hoping that this will give people a chance to experience and share what his music and philosophy is all about. If you are looking to book a classically trained guitar player look no further than Mark Loy. I have personally attended one of his shows and the music speaks for itself. Thank you again Mark.